Oh, good morning. Are you still eating cereal, like a jerk? Well, stop it! 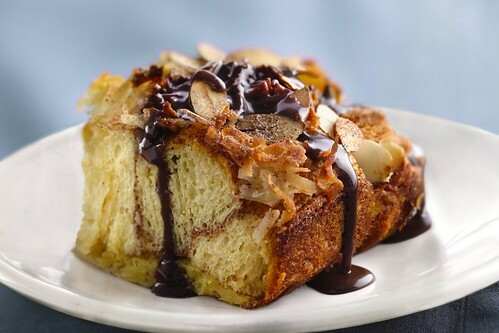 Because you could be eating Almond-Macaroon Coffee Cake. "Buttery, flaky biscuits are the center of an indulgent macaroon coffee cake." says finalist Linda Bibbo of Chagrin Falls, Ohio. Get in my mouth! Say I. Heat oven to 350°F. Grease bottom and sides of 13x9-inch glass baking dish with 1 tablespoon of the butter. Place 3 tablespoons of the cinnamon sugar in large resealable food-storage plastic bag. Separate dough into 20 biscuits; cut each into quarters. Place in bag with cinnamon sugar; shake to coat. Arrange pieces in dish; sprinkle with coconut. Measure 1/2 cup of the condensed milk in small microwavable measuring cup; set aside. Pour remaining condensed milk into medium bowl. Add eggs, 1 teaspoon of the vanilla and almond extract; beat with wire whisk until well blended. Spoon over biscuit pieces; sprinkle with almonds and remaining 1 tablespoon cinnamon sugar. Bake 30 to 35 minutes or until golden brown. Cool on cooling rack 20 minutes. Meanwhile, add remaining 1 tablespoon butter and chocolate chips to reserved condensed milk. Microwave on High 30 to 45 seconds or until chips are melted; stir until smooth. Stir in remaining 1/2 teaspoon vanilla. To serve, cut into 15 squares. Place on individual plates; drizzle scant tablespoon chocolate mixture over each serving. Garnish with mint. Serve warm.